Powers: Animalistic physical characteristics. Also Ambidextrous. What!? : He’s as strong and a gorilla, as quick as a cat, and as flexible as a gorrilla-cat. Origins: In an alternate timeline ruled by the mutant Apocalypse, Henry McCoy was a sadistic genius who became Apocalypse’s leading expert in genetics, second only to Mr. Sinister. McCoy’s cruel experiments earned him the nickname “Beast.” When this “Age of Apocalypse” timeline was unraveling, “Dark Beast” escaped to the mainstream universe, but 20 years too early. He survived in the sewers of New York, and spent him time secretly manipulating and experimenting on the underground mutants known as the Morlocks for years. McCoys was again forced to flee from his home during the Mutant Massacre of the Morlocks, ordered by Mr. Sinister. Fearing that this universe’s Sinister was just as bad as his own, Dark Beast kidnapped his mainstream counterpart and took his place within the X-Men. He managed to keep up the ruse until the Onslaught incident, where Professor X’s psychic powers and Magneto’s evil fused into one malevolent being. McCoy exposed himself in an attempt to curry favor with the powerful being, and was captured when Onslaught was defeated. McCoy was freed from his prison by Havok, who intended to destroy McCoy’s secret labs by earning his trust as the leader of the “new” Brotherhood of Evil Mutants. The trick worked, though Dark Beast still managed to escape. McCoy resurfaced again on the destroyed mutant island of Genosha, where he offered his services to Professor X and Magneto after being defeated by them. After M-Day, Dark Beast made an uneasy alliance with regular Beast in an attempt to restore mutant kind, but his unethical methods ended their partnership. Dark Beast then became a member of Normal Osborn’s “Dark X-Men” for a time as their resident scientist. When everyone in Osborn’s regime was imprisoned, McCoy was allowed to go free by X-Force, who needed him to help Angel, as he had reverted back into his Archangel personal. McCoy, however, betrayed X-Force and turned his allegiance to Archangel. 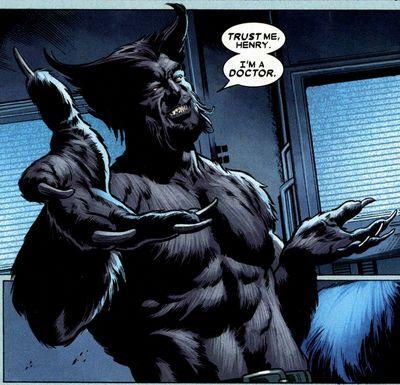 When Archangel is defeated, McCoy manages to return to his own timeline and attempts to help Weapon Omega, an evil version of Wolverine. However, the timeline is once again threatened, and before it is closed-off forever, Dark Beast escapes once again to the mainstream universe. 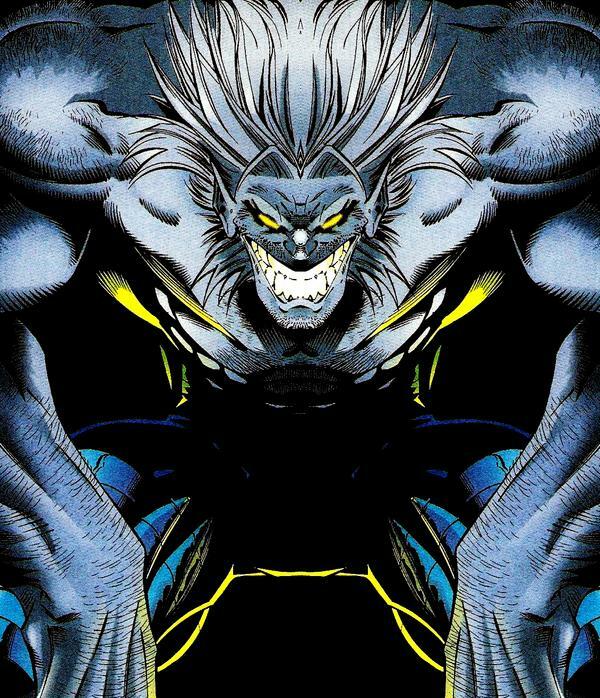 His Deal: Dark Beast is an evil version of Hank McCoy from the Age of Apocalypse storyline, also known as Earth-295. In that universe, he had a hand in creating fan favorite Blink, and Apocalypse’s son Holocaust. Due to traveling back 20 years too early, Dark Beast also influenced many people in the mainstream 616-Universe. He influenced the development of the Morlocks, and accidentally led to their destruction due to using some of Mr. Sinister’s methods and data. He had two semi-loyal servants in Random and Fatale. His memories of a mutant ruled Earth may have also caused Onslaught to decided to kill both mutants and humans. He’s joined the Brotherhood of Mutants many times. Dark Beast has usually been the enemy of many secondary X-Team, including X-Factor, X-Force, Generation X, and X-Treme X-Men. His two biggest enemies have usually been Beast and Nate Grey. Personality: Like his name suggests, Dark Beast is an evil version of Earth 616’s good Beast. Dark Beast is a completely unethical and sadistic scientist, who wholeheartedly enjoys causing pain to others. He is also a staunch believer in Apocalypse’s mantra of “survival of the fittest,” and regularly experiments everything, including himself, to create the perfect creature. Dark Beast has shown a surprisingly consistent loyalty to Apocalypse and his heirs, including Archangel and Weapon Omega. He has also shown a willingness to work for anyone stronger than himself in order to survive, such as Onslaught, Professor X, Magneto, and Norman Osborn. Like his Earth 616 counterpart, Dark Beast also has a rich vocabulary, and can be quite sesquipedalian. Fun Fact: Dark Beast actually knows less than regular Beast because he chose to focus only om genetics instead of multiple fields like Beast.